I have two copies of this book and I am giving one of them away. I had purchased it for a friend not knowing she already had a copy. She told me to return it, but since I wanted to join the give away I will give it to someone who comments on my blog. RANDOM DRAWING … Names drawn from a hat by my grandson. GIVE AWAY WILL CLOSE on January 1st my next day off from work. One chance per person. This book was written by award winning quilter, JANET PITTMAN in 2006. I got my copy about then and this book has been my bible for machine and hand applique techniques of all kind. I also liked the realistic patterns for leaves and flowers… easy enough for beginners but realistic enough to look like you just picked them. 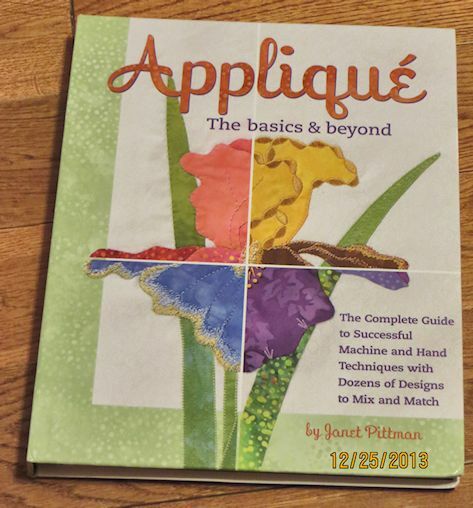 Must have book to new appliquers …. I have include AMAZON LINKs to the book so you can check out the reviews.